Added Guild territory war and its mechanics into the topic. if you’d like to see the extracted portion of the guild news, be sure to click on the Official Guild News History below. All changes that have content update towards guild are extracted from the patch notes and placed there with formatting. 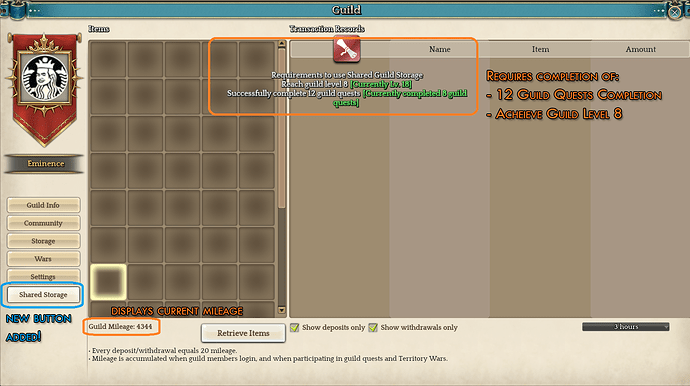 Added a missing benefit for joining guild which is additional 5 points for being in a guild and logging in. Clarified some information on the farming & guild companion. Extracted Boruta information and placed under the Official Guild News History. Edited Mishekan Forest loots based on what we’ve received in Re:Build’s Completion. Revamped information to include Re:build’s update changes are the following. 1.3 Added Exclusive Guild NPCs under Guild Benefits. 1.5 Changed / Edit some images to fit in Re:Build’s revamp. 1.6 Added Guild Alerts under Other Information. Moved the huge text of guild news into the official guild news category below to conserve space. Guide has been rename [SUBMIT] to contest into the community rewards. Minor editing of certain text to make it much clearer and concise. Added Guild Reward Box Listing. Based on hundreds of boxes that we’ve opened we’ve added the listing on the second post to indicate what Mission, Boss Raid, Special potions can be obtained from Guild Events. Added Mishekan Forest details thanks to @DestinedWing . Revised Pantorex item drops to include the missing items that weren’t there. Added a few more information on the drop loot sheet on the 2nd post. Minor adjustments on 2nd post formatting and rewards listing. Removed further irrelevant information from the main post. Full Revamp of the Guide to Guilds to accommodate the current changes to the guild. Removed all irrelevant topics and added new information. Guild event listing currently includes 2 different colors to indicate different rewards. please note that this is only for boss kill rewards only. New! Latest guild listing includes level requirement for the events, please let me know if any of them are wrong. HUGE CREDITS TO MIENZ FOR GIVING THE KOREAN SPREADSHEET! Edited guild rewards listing. As this is a highly sought information, this will be placed on top for better viewing. Practonium itself has been found. It drops on Level 14 guild boss kill. This has been confirmed with a screenshot from the ktos thread. After balance patch, all bosses seems to be heavily nerfed. you do not need to be incredibly geared to pass them. Level 7 guild missions and level 15 guild missions bosses have been nerfed and buff with average 7m hp as opposed to 700k and 250m per boss previously. Boss hunts at the lower level has been buffed starting from 20m hp together with hard bosses which scales with members. 20 people brings the boss up to 162m hp. Further calculation still needed, but average each person brings about 7-8m of HP for the boss. Edited the reward listing to include Manticen from @Sandu and also to confirm the Mythical Cube Recipe drops on Gosal boss kill. Required guild level 14. Edited the guild event rewards listing, credits to @Plasmagica, @trielav for helping out on the confirmed rewards. Edited a few information on the other information category. Added more information on the guild event listing based on the new content. We have confirmed the following details. Tidied up the guild guide. Added Latest official guild news below here as an easier access for official guild information. Added Archive change log to reduce clutter on main page. Added additional information about shield charge. Added more details onto the guild reward sheet. Added some minor information about speculations for Academy. New regional raid added: Borutos Kapas. To enter the raid, visit the Kupole Kaze NPC in Vedas Plateau. The raid is accessible to characters of Lv 360 who have completed the quest ‘Dragon Boruta’. Entries consume one Urbas Seal, an item which you can obtain by completing the Dragon Boruta quest or from monsters in fields of Lv 330 and above. Urbas Seals cannot be traded through the Market. Boruta’s HP is displayed as a percentage (%), and he restores HP every 20 minutes after first appearing. Boruta appears in combat mode at different times throughout the day. The schedule (applied to each server region in local time) is as follows. After Boruta is defeated, it resets the next Monday at 06:00. From the time he is defeated until the next reset, the boss appears as Fatigued Boruta, and players become unable to perform hostile acts against each other inside Sulivinas Lair. After Boruta is defeated, [Mark: Borutas Kapas] is applied to the guild with the greatest degree of contribution. Mark: Borutas Kapas lasts for two weeks, with different effects applied within Sulivinas Lair on the first and second week. Sulivinas Lair is the region where players will face Boruta. It can be accessed by players in a party or individually. Players in a party must all belong to the same guild, otherwise the party will not be able to enter. If you do not wish to enter with your guild members or you don’t belong in a guild, you can enter alone. After entering the Lair, all players except fellow guild members are considered as enemies. Creating and joining parties is available inside Sulivinas Lair (with members of the same guild only). While in Sulivinas Lair, you cannot invite members from outside the Lair into your party. Guild members in your Lair party cannot abandon the guild during the raid. Visit the Kupole Kaze NPC at the Abandoned Mine Entrance in Vedas Plateau to enter Sulivinas Lair. This NPC also performs the following functions: use Urbas Seal, check player/guild contribution, receive guild rewards, receive personal rewards. A new NPC, Royal Supply Officer Manfredas, is added to the Guild Hangout. At this NPC, you can exchange [Medal of Honor: Boruta] for the following items. In order to defeat Boruta, you must first receive this quest at NPC Kupole Kaze. The quest’s rewards are as follows. Individual players and guilds earn points according to their contribution in defeating Boruta. When Boruta is defeated, the following items are awarded according to your total points and category. Boruta Card is now available in game via the Boruta Guild Raid. Seal items can be obtained through Borutos Kapas. There are different Seals for each class tree, and you can only equip those that correspond to yours. Seals can be enhanced at NPC Teliavelis. In order to enhance a Seal, you need another Seal of the same grade and enhancement value (of any class tree), Magic Stones, and Silver. A slot will be added to your inventory where you can equip your Seal. Due to changes in the nature of the Templar class, Guild Tower skill functions will now unlock according to skill level. The new Shared Guild Storage is available for guilds of Lv 8 and above that complete 12 Guild Quests after the maintenance on January 15, 2019. The Storage comes with a base of 40 slots, with +10 slots added at Lv 10, Lv 15 and Lv 20 each (total of 70 slots at Lv 20). In order to deposit items into the Storage, members must have that authority within the guild, as well as a Trade Grade of 5 or above. Members also need to have the corresponding authority in order to withdraw items from the Storage. Only tradable items can be deposited in the Shared Guild Storage. Deposits and withdrawals cannot be made by characters in combat mode. The Storage is not available during TBL matches or in GvG areas. Every Shared Guild Storage deposit and withdrawal will accumulate 20 mileage points (shared with the entire guild). Other actions that accumulate mileage points are daily logins (3 points), participating in GTW (30 points) and clearing Guild Quests (15 points). Added new repeatable quest [Guild Foundation]. This quest can be played by characters of Lv 250 and above after completing a guild quest. [Guild Foundation] allows for one entry per team, per week (resets every Monday at 06:00, server time). To increase your contribution in the repeatable quest, defeat monsters for 5 points each, or complete a guild quest to earn each guild member 100 points. When your contribution reaches 200 points, you can receive one of the following rewards. Achieves +15 enhancement on a high-level Unique or Legend equipment item. Achieves Stage 10 transcendence on a high-level Unique or Legend equipment item. Completes a character’s final advancement. Achieves the maximum level on a character. Is the first in the guild to achieve a certain value in physical/magic attack or physical/magic defense (units of 10,000). Levels up the guild with their contribution. Becomes incapable of combat (GvG). Characters between Lv 150 and Lv 150 with no guild receive up to 5 alerts per day about joining a guild. Players with authority to accept applications will receive an alert whenever a new application is made. Guild community posts and comments can now be deleted by the Guild Master and guild members with the corresponding authority. [Show recruiting guilds only] filtering option added to the guild promotion board (this option hides guilds at maximum capacity). [Check online members with authority to accept applications] function added to the guild promotion board. Guild invitations received directly through a character will now include a link to the guild’s information page at the promotion board. Application messages will no longer allow for line breaks. If the message is too long, it will be cut short by an ellipsis. Hello everyone! 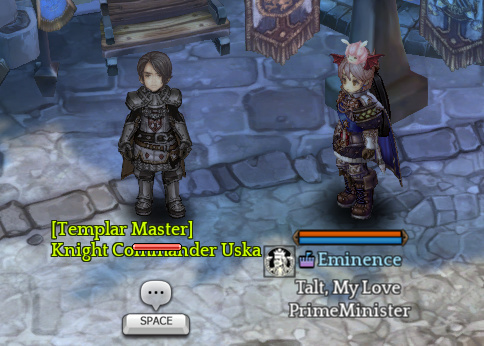 My name is PrimeMinister from Telsiai and I’m the guild leader of Eminence. From many of the various people that I’ve met, there are only very few who are have knowledge about what are guilds all about. Therefore, in order to help everyone understand a little further to what guild are about, I’d like to extend my knowledge that i know so far. There are of course many benefits of joining a guild and I’ll explain them the best that i can within this thread. If you found any sort of information that is incorrect or lacking, feel free to let me know down below. To create a guild, simply be at least Level 40 and head to the Klaipedia Master. Note that you need at least 1 million silver in order to create a guild. Once you’ve joined a guild, All your characters will automatically be placed into the guild. 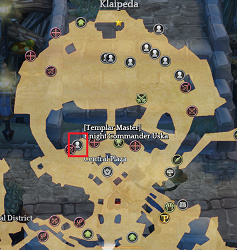 He can be found in Klaipedia location at this area here. Simply talk to him and select Create a Guild and you’ll be on your way to have your own guild! Information: For newer players, that have just joined Tree of Savior and reading this guide. Previously before a major patch on 15th January 2019, the Templar class was needed in order to access all functionalities of a guild, this requirement has since been removed and no longer valid. Any class can obtain full functionality of a guild as long as their guild continuously levels up. There are 3 skills in total that you can increase for the guild. Here is a summary of all 3 skills. Increasing Guild Slot - each point in this skill will expand your guild capacity by 3. The guild starts off with 50 members initially and can expand up to 95 members. Breeding - Each point will determine the number of companions you can breed at one time in the guild hangout. Farming - Each point will determine (skill level * 3) number of seeds you can place in the guild hangout. Each seed upon a successful harvest will yield you 50x of that seed. For example, 1 Dilgele seed upon successful harvest will provide you 50 dilgele upon harvesting it. Joining a guild (depending on your guild level) provides everyone benefits! To summarize, here are some of the benefits you can get among joining a guild. Able to perform farming within the guild hangout. Able to obtain exclusive guild reward items from guild quests. Able to obtain some guild exclusive quests for up to 5000 attribute points weekly. Locate parties to do dungeons, raids, and other content easily. Earn additional 5 points for logging into the game for your class change points for being in a guild. Seeds can be placed / destroyed / harvested by anyone at all that have the appropriate permissions. This can be set in the guild Roles and Authorities to provide the relevant permissions for the members to use the farm. Therefore, if you’re not able to use the hangout farm, be sure to bug the Guild Leader to provide the permissions to allow you to farm. One thing worth to note is that over-watering your plant will kill them therefore avoid that at all costs! Planting seeds also requiring the farming skill from your guild skills. each level of the skill provides you 3 seeds to place. Therefore if you plant 3x dilgele seeds and harvest them, it’ll net you 150 dilgeles! Seeds can only be used in the Guild Hangout. note that during maintenance time, the time will be freezed. Similar to seeds, companions can be placed, released or obtained by anyone at all within the guild that have permissions. The difference between farming is that the person who placed the guild companion will have their name attached to the companion, however take note that anyone can still harvest the pet once it reaches maturity. The food that it consumes before and after maturity is different. before maturity (within guild hangout) it consumes the normal companion food that can be purchased by any companion trader in any town. During the growing phase, if it dies without feeding, you will lose that pet forever. However once the pet matures, it will not die and acts like a normal companion where not feeding it will not kill the pet. Only mountable classes are able to mount the pet. However as of this point of time, Alfafa is purchasable through the companion trader in Klaipedia / Orsha for 10k silver each. Therefore unless the pets level up, the stamina bar will always be 0. Getting a Guinea Pig gives better stats compared to the original Hoglan. With the recent Re:Build update, it has brought upon a new repeatable quest that resets every week on Monday 6am server time. The guild quest itself is extremely easy to achieve. The rewards that you receive weekly are the following. As shown in the image above, here are the detailed instructions on how to begin them. Step 1: Begin any guild quest. For all participating players, you will automatically receive the quest in your quest log upon accepting the guild quest. Note that only players who have permissions can begin the guild quest. Step 2: Complete the guild quest by getting the required points. There are 2 ways you can obtain points. Either by killing monsters which provide you 5 points, or complete the guild quest itself to gain 100 points. Once you’ve reached 200 points, you’ll automatically receive them upon quest completion. Note that the monsters killed inside the guild quest will only be counted. Step 3: Get your free 5000 attribute points automatically upon finishing it! Note that it is character bound, therefore if you have a certain character you’d like to benefit for the points, be sure to use that character to receive the points accordingly. As part of the recent update in Re:Build, 2 new NPCs are present in the guild hangout. The NPC’s functionalities are as follows. Expedition Merchant - Allows you to purchase items that may help / required for guild territory wars with silver. Royal Supply Officer - Allows you to exchange items in exchange for Medal of Honor: Boruta. Obtainable by joining the Boruta Raid. Guild shared storage is a new addition in Re:Build’s update. With this, you’ll have a new button in your guild menu which allows you to transfer items via a shared storage. Note that Storage and Shared Storage in the guild represents 2 different things. To distinguish both storages, here are the explanation and uses for them. Storage:- All guild quest rewards are placed here. No guild mileage is consumed at any point of time for withdrawal of items. You cannot deposit any items into the storage. Only the guild leader is able to distribute items in the storage. The image below shows the shared storage button and some information about it as well highlighted in the image. Participation in Guild Territory War and its mechanics. IMC has pasted a very detailed guide about the Guild territory war and it’s mechanics. Therefore i’ll paste the information down below here regarding the Territory war and it’s information below. There are 2 types of guild events. Depending on your guild level, some of these features will not be available. All guilds now have 3 tickets to use that is refreshed on every Monday 6pm Server Time. It is highly advisable to finish all of the tickets before the week ends as each and every event will provide drops and experience to the guild. Guild Boss Hunts - Very straightforward, heading to the location and defeat the boss. Guild Missions - This involves a series of challenges, Depending on the type of mission, you’ll may have to destroy some points, defend some points, solve puzzles and many more. I’ll list down the type of events that are available on the 2nd post below. Click the link below to head there directly! 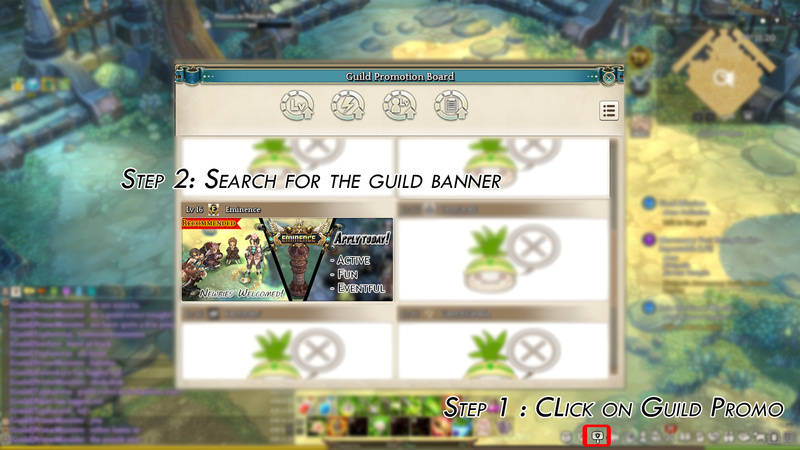 In order to promote your guild, there are multiple ways to do so! Currently the first and foremost is adding an emblem! The first time you register an emblem, it is free of charge, however the 2nd time onwards, there’s a 12 million silver fee. 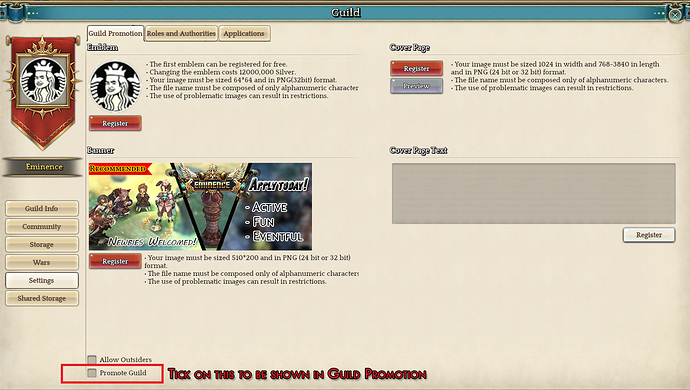 Be sure to tick the Promote Guild located below in order to ensure that your guild is advertised in the Guild Promotion! You can find the emblem under settings for the options below. 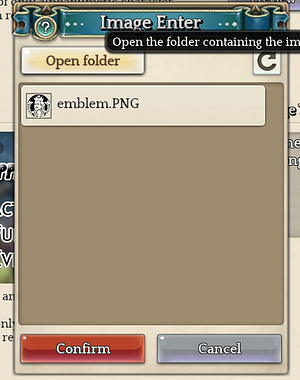 After you’ve created your emblem, click on register and on Open Folder to open the upload folder. Place your emblem there and click on refresh. If you’ve done it successfully, it should appear as below. 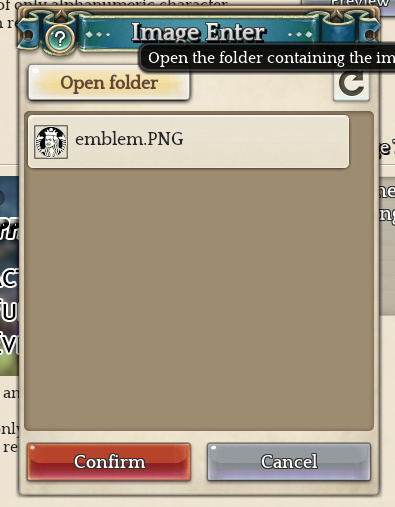 Emblems must be in PNG (32 bit) format and sized 64x64. After registering an emblem, you will not be able to change it for another week. The first emblem can be registered for free. Changing it consumes 12,000,000 Silver (subtracted from the guild funds). Be sure not upload any indecent emblems or you may face suspension! This will be what will be shown to the players, for example, look at the image below when someone clicks on the Guild Promo! If you’d like to know how it looks like in game, you can see a sample from here as well based on our Banner. Cover pages are what will appear when a member clicks on the guild Promo. Use this to your advantage to promote your guild as this will automatically appear when a member clicks on your advertisement! Your file can go up to 768 * 3840 in total size in PNG format. If you’d like to view our sample, check out the link below! In order to access the guild storage, it is a fairly hidden button if you’re still new to guild mechanics. You can either press alt+G to bring up the guild menu, or find it under your quick menu on your bottom right (where all the icons are at). From there, select the storage menu and you’ll see all the items listed there. 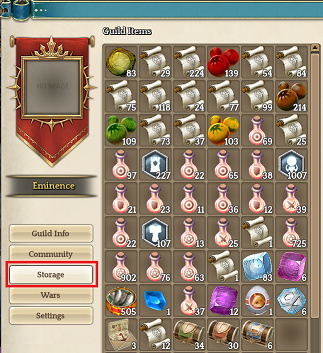 Upon clicking the image, you should be able to open up your current guild’s storage. Do take note that only the guild leader is able to distribute all the rewards. Here’s a sample of what we have gotten so far from the guild events. Within the same page, you’ll notice that there are guild funds located in the guild. Unfortunately, as of this point of time, the funds can only be used to change your emblem. The first time you register an emblem is free, however the 2nd time you’d like to change, there’s a 12 million silver fee. The fee is deducted from the guild funds. A guild tower only lasts for 7 days upon placing it. It can be obtained via the templar master and each Guild Tower costs 100,000 silvers. This can be purchased from the Templar Master in Klaipedia. If you place some seeds or rare a hamster within the period and the tower expires, the seeds and hamsters time still countdowns as normal. You can donate talts via the guild tower. Click on upgrade guild then drag the talts into the box and click upgrade guild. 1 Talt provides the guild 20 EXP. All Guild Events can only be started from the Guild Tower, the Guild Master and players who hold the permission to start guild events can begin them. You can directly invite a person to the guild by typing /guild PrimeMinister (Please note that it is case sensitive) and it will not work if the person is in a instanced dungeon. Guild Leader Transfer: Only available from Templar to another Templar Players. Require both of them to be in a same guild and inside Guild Tower for the option of transferring leader available(right click the player name). cooldown is 7 Days for each transfer. don’t forget to scroll below to check out next part of this guide on the mission listings! What are the duty/possibilities of a Templar right now? [SEA - Telsiai] Eminence | We're Recruiting! Is there a time limit for these missions? thank you, is very useful. There are time limits to each instance, but most of the time you should have enough time to complete each missions. For example the hamster missions that gives you 90 minutes if i’m not mistaken, depending on how many people you have, just about 10-15 minutes is sufficient to finish the mission. What you know about guild missions who give forge and shield? You know how to get the itens to make the forge/shield? And the mission name? the guild missions that gives forge and shield are from boss kill that we did. with the latest imc patch it comes with new events from the guild. for those that i’ve tagged with boss kill/hard are the new ones from IMC. they can range from 700m to 1.6b+ depending on how many members are there. killing the bosses and completing will give you the item directly. the recipe costs 33 talts to craft if i recall. Lvl 10 Guild mission ? i can’t say for sure as we’re level 12 at the moment. i know for a fact that honeypin boss unlocks at level 12.
anything that is firelord and above is considered a new boss. from what i recall, guild level 7 unlocks your mission to get a guinea pig. guild level 10 unlocks your first raid, followed by guild level 11 for the second raid. If you get the information about the guild mission who give forge / shield (guild lvl requeriment, mission name or whatever) please, post here. this is not sufficient enough? i don’t have exactly the requirements for each guild mission as i did not record that down. they can range from 700m to 1.6b+ depending on how many members are there. How many of you guys was there to the 700m boss? We did a 2 and 5 ticket boss with a ridiculously low amount of hp, it didnt seem to scale very well. Also, what does the Academy prize stands for? Yeah, you are very helpfull!! Thank you!! But i want to know how much talts i need to unlock forge/shield missions. Apparently (at least in Klaipeda) being in a guild is a free pass for being a pompous douche to everyone you meet, as well as being a troll to any dungeon groups you join. About 10 of us scaled the boss up to 1.6b hp. I’m currently guessing that you were dealing with the old content for bossing. Is the boss level 285? If it was then you may not have sufficient level to unlock the boss hunt. I believe the first one should start from firelord which consumes 7 tickets. This will be the boss that will redefine how boss hunts works. No worries we are all moving there step by step. Just keep in mind to have fun as a guild. Unfortunately I remember seeing that list somewhere, but I’ll have to check on that Tomorrow. If I do manage to find it I’ll let you know. As of now for level 12 we have about 17k+ talts donated into the guild as an overall. I’m sorry to hear that, however it is generally much more fun to play together than alone from my opinion. I hope you’re able to find a guild thats not being a douche as you mentioned. Thank you for the info! I guess we have enough tickets for firelord. I’ll give a try. I believe IMC should give you a gift for your work here. Maybe 10 Abrasive Gems, why not? I’m cheering for you. This not only help the community as it required really effort to be done. Also this probably will contribute to numerous guilds that will be created in the future. Thank you so much on investing your time for fellow player to understand more about guild. -So guild raid only gives you academy and no forge? -And can a guild continue their half done raid for other day? Considering the raid consist of many stages. -and how much matk the academy boost for guild member? Does it count like a forge with a max of 5 unit? It wont let you place the academy because it says you dont have the required skill but there is no skill for that one like forge and shield charger.